There are still some who are in doubt of Alfred Hitchcock’s genius as a director, to whom I address this question: who else in the history of cinema could invest a scene with such an unbearable air of tension simply by showing us a case of champagne slowly being depleted? This occurs two-thirds of the way through Notorious, in the centrepiece party scene which begins with a most elegant, sweeping single shot, crescendos to a frantic race against time before ending with its characters making a series of crucial discoveries: ten extraordinary minutes which amply illustrate the master suspense-maker at the peak of his craft. Like most of Hitchcock’s best work, Notorious is ostensibly a thriller, but the audience has long-since focused on other more important matters by the time the credits roll. The film opens with an introductory placard giving us the very specific place and time at which events begin to unfold: Miami, Florida, Three-Twenty P.M., April the Twenty-Fourth, Nineteen Hundred and Forty-Six. The use of verbose wording as opposed to more succinct numbering of the date and year call attention to its specificity, the very opposite of the imprecise fairy-tale “Once upon a time”, yet by the end of the film, Prince Charming will be called upon to rescue Sleeping Beauty from her imprisonment. The opening scene, indeed the very first shot – that of a paparazzo’s camera – highlights the theme of voyeurism, one which is clearly prevalent throughout much of Hitchcock’s oeuvre. For a film about the rights and wrongs of espionage, there is a delightful irony in the way that we then peek into the courtroom, the shot framed by a doorway, to watch Huberman Sr. being convicted of treason, and then to follow his daughter Alicia out of the courtroom past the baying press-pack; if we are at first appalled that she is being personally hounded for her father’s crimes, then we must quickly remember that we too will demand to know more about her during the following 100 minutes of the film. The following scenes will indeed introduce us to this woman, and the other dimensions to her notoriety: her drinking and apparent sexual promiscuity. Both of these converge at a party at her house where a silhouetted stranger is the latest target of her inebriated advances. We as an audience know that this will turn out to be the debonair Cary Grant, but as Alicia’s drunken charades continue, he is kept in shadow and with his back to the camera, as if he is just another spectator, sitting in the cinema row ahead of us. He will turn out to be Devlin, a CIA agent whose job inherently involves anonymity, and whose lack of a past and emotional coldness will be sharply at odds with Alicia’s vulnerable humanity. The CIA has a job for Alicia: to travel to Rio and infiltrate the confidence of Alex Sebastian, an old flame of hers now suspected of collaborating with what remains of the Nazis on some form of new weapon. The weapon is the Hitchcockian MacGuffin, a device used to propel the story forwards but itself of little importance, except here it underlines the theme of espionage, allowing the director to utilise an increasingly subjective camera: slow reveals and point-of-view shots placing the viewer too in the role of government spy. Suspense demands a certain degree of empathy, so our increasing identification with Alicia heightens the air of dramatic tension. This set-up of the film allows the conflict between two sets of competing poles: the stuttering romance of the leads is continually hampered both by the requirement of the mission for Alicia convincingly to seduce Sebastian, as well as the clear personality differences between her and Devlin. As the stakes are gradually ratcheted up we see her desperately try to get him to put his love for her above his job, but his emotional passivity disguised as professionalism repeatedly drives her further away from him. One of the great strengths of the Notorious screenplay is how the danger to the central romance and the physical danger to the protagonists are both steadily raised in parallel with each other. As Alicia is driven away from Devlin and however reluctantly towards Sebastian, so her deeper immersion into Alex’s world puts her in greater peril: on first viewing, the casual way in which poor Emil Hupka is escorted from the dinner party after creating a scene suspiciously does not appear to signify much, but this is the first signpost towards indicating the very seriousness of the stakes involved – the implication of his demise comes later, as we figure out how far Alex and his cohorts are willing to go to keep whatever is secret, secret. All the while, this seems to be a world away from the CIA operatives in the safety of their comfortable offices. 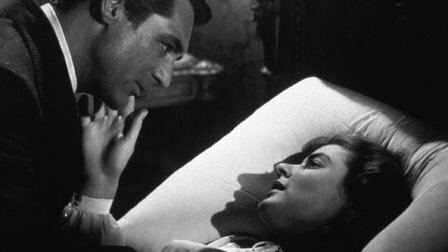 Notorious could well be argued to be Hitchcock’s most visually rewarding film: if one pays careful attention, all manner of cinematographic trickery is used throughout, but never seems to draw too much attention to itself, or to be affectedly showy. See the brilliant repetition of the use of the combination of silhouette and a Dutch-angle camera, firstly towards the start of the film and then again devastatingly as the film enters its final phase – and note how this so elegantly underscores the dual intoxication motif. And then there are the famous shots: firstly, that famously long ‘kiss’ between Grant and Bergman lasting three minutes, a tracking shot in medium close-up somehow transferring from exterior to interior and seeing the pair exchange screen position twice, something of a dance between the two which cements their intimacy. The aforementioned shot at the cocktail party, which seems to glide us down the Sebastian mansion staircase bannister. For the cineaste, the film is rich with so many echoes of both Hitchcock’s previous and future films: the presence of his common themes of voyeurism, the control of women, doppelgängers, identity deception, overbearing mothers and the seeming banality of evil render Notorious as allusive as a Joyce or Nabokov novel. Some comparisons deserve more appraisal than others: the use of point-of-view naturally anticipates Rear Window (1954), the famous long kiss will be repeated in Vertigo (1958), while the Sebastian mansion is eerily reminiscent of the De Winter house of Rebecca (1940). Slavoj Žižek famously made the case for Norman Bates’ house in Psycho (1960) to represent the three levels of psychoanalysis, and there is a parallel here: Sebastian’s mother inhabits the upper level, respectable socialising takes place on the ground floor, while the dark truth is eventually located in the wine cellar. The casting is impeccable, indeed it may be difficult to imagine any other actors taking the place of leads Cary Grant, Ingrid Bergman and Claude Rains. Grant is the apotheosis of his on-screen persona: always much more than the popular caricature of the suave ladies’ man, under Hitchcock he reveals his depths as a character actor: stilted, emotionally repressed, bubbling with internalised rage which he is unable to release. This, along with Casablanca (1942) would be one of the two popularly iconic roles for Ingrid Bergman, before the scandal of her affair with Roberto Rossellini would put her in the spotlight for all the wrong reasons. For me, this performance along with Valli’s in The Third Man (1948) stand as the two greatest female lead performances in 1940s English-language cinema. And spare a thought for Claude Rains, behind the two handsome leads, but somehow his Alex Sebastian holds everything together – like the others a pawn in a greater game, and one whose disposal of at the denouement comes close to being tragic.